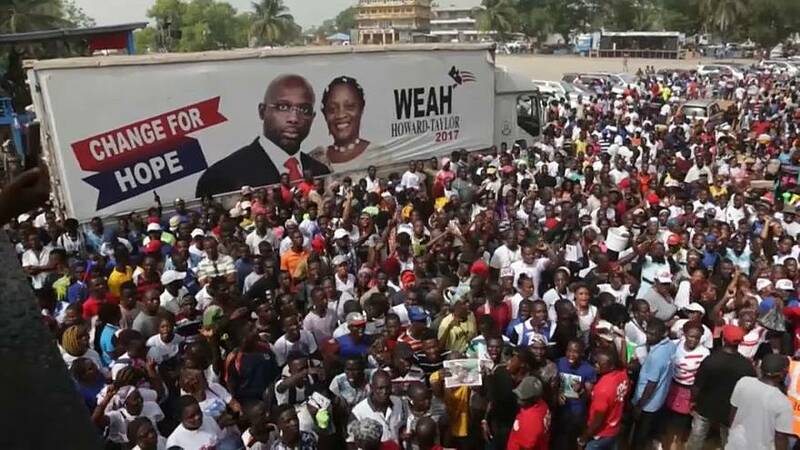 Hundreds of supporters gathered outside the party headquarters of Liberia's president-elect George Weah after his emphatic victory in the country's election was secured. Liberia's election authorities confirmed he had won 61% of the vote in the run-off against the current vice president Joseph Boakai's 39% in Monday's run-off vote. The crowds danced and cheered as Weah arrived at his party headquarters on Friday. Boakai conceded defeat in a move that will ease the way towards Liberia's first democratic transfer of power since 1944. When he is inaugurated next month, the 51-year-old Weah will face the daunting challenge of improving life for ordinary people. Liberia's economy contracted last year with waning support from overseas donors. The IMF lowered its growth forecasts for 2017 and 2018. The country has also been hard hit by chronic infrastructure problems, including regular power cuts and poorly-maintained roads, as well as the 2014-16 Ebola outbreak that killed thousands. Liberia ranks 177th out of 188 on the United Nations Human Development Index.